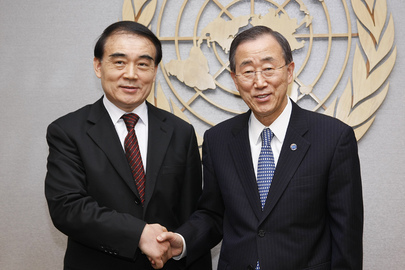 UNITED NATIONS, March 18 -- In front of the UN Security Council late Friday afternoon, Chinese Permanent Representative Li Baodong, the president of the Council for March, told Inner City Press he had just gotten a call about Libya and Resolution 1973 from the UN Secretary General, Ban Ki-moon. Inner City Press asked Li what he thought of the resolution and events since it was was passed, with abstentions by China and four other countries: Russia, India, Brazil and Germany. Was it Germany that surprised you, Inner City Press asked. The Security Council meeting were long over. There was almost no one else around. “Have a good weekend,” Li Baodong said, and left. We'll see what happens in Libya. Watch this site. UNITED NATIONS, March 17 -- The Libya resolution passed the UN Security Council Thursday evening with ten votes in favor and five abstaining: Russia, China, Brazil, Germany and India. Russia said that its ceasefire proposal had the support of “a number of (Council) members,” and that its questions on the resolution just adopted remained unanswered. What are the limits of the use of force? He said if things go badly, it will be the responsibility of those who use force. Brazil's Permanent Representative said her country is sensitive to the call of the Arab League for a no fly zone, but that the resolution in Paragraph 4 went beyond it. Germany's Permanent Representative Wittig also said that military force carries risks that have been under estimated. India through its Deputy Permanent Representative criticized the whole resolution, saying the Council should have waited for the report of Ban Ki-moon's envoy Al Khatib, and that sanctions may hurt the Libyan people. After the vote, Inner City Press asked Libyan diplomat Ibrahim Dabbashi to respond to India's statement about the sanctions hurting Libyans. Dabbashi's response was only that the resolution does not allow foreign occupation. Inner City Press asked Dabbashi about the possibility at some point of UN peacekeeping mission. No, Dabbashi that, not that. He said it's the Libyan people against Gadhafi. Lebanon's Permanent Representative took questions, and Inner City Press asked him about the critique of some of the abstainers that the resolution went beyond what the Arab League has asked for. He replied that the Arab League only spoke about a no fly zone. Exactly. Susan Rice took a few questions then it was “last question.” Since she had said Gadhafi had lost legitimacy by attacking his own people, Inner City Press asked, “What about Bahrain... and the crackdowns there?” These have included attacks on hospitals, blatant violations of international law. But Susn Rice was gone. Footnote: Before she spoke at the stakeout, Susan Rice was speaking with a Sudanese diplomat from Khartoum. Inner City Press is seeking the US read out on the communication, and what the US is going to do, especially at the UN, about the stand off between SPLM and Khartoum on the reports of Khartoum aiding the two renegade generals in and around South Sudan, and on the crackdown on student protesters in Darfur that even UNAMID reported on earlier today. Watch this site. Inner City Press asked, what if a pilot is shot down? But Juppe walked away from the UN microphone, ending the question and answer session. The phrase is from a (late) March 16 draft of the Libya resolution, labeled S/2001/142, which Inner City Press has obtained and as a public service is putting online here. There are media outlets who wave documents around on camera, who say they have different versions. We say: put them online and let's see. Let the public view them. Juppe's response is public record. In the run up to the six pm scheduled vote, long time Council observers mused back to Iraq and Bosnia, predicting that even abstaining countries will use their explanations of vote to show a commonality of purpose. South Africa is said to have indicated they will vote for. Germany it would seem, from its foreign minister's statements, would abstain. But how fast might bombing start? Watch this site. 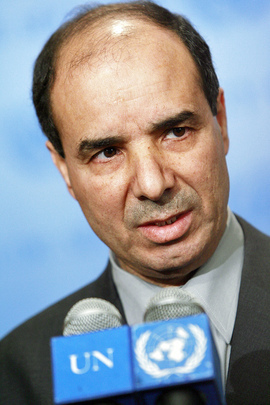 As UN Council Slows on Libya, Dabbashi Says “10 Hours, Treki in Cairo"
UNITED NATIONS, March 16 -- While the UN Security Council went through its five page draft resolutions paragraph by paragraph, Libyan diplomat Ibrahim Dabbashi came out to talk to the Press. He had prepared talking about, about Gadhafi using mercenaries “who fought in Congo, Rwanda, Burundi and Uganda,” from Niger, Mali (off camera) and Chad (on camera). Chad's Permanent Representative has told Inner City Press that while they may be “individual Chadians” fighting with Gadhafi, the Deby government does not choose between him and the rebels. “How many planes do you have?” Inner City Press asked Dabbashi. Enough, he said. He said the rebels' use of these planes has driven Gadhafi crazy. After a series of questions about timing -- Dabbashi backed off the ten hour figure, ending up saying the revolutionaries are “not counting” on the Council -- Inner City Press asked him if the UN Secretariat has spoken to him about the letter from Gadhafi's government saying he and Shalgam no longer represent Libya, or if he thought the UN Secretariat now recognized the rebels as the government,as France has. We are continuing our work with credentials, Dabbashi said. He was asked, Where is Shalgam? He is here in New York, Dabbashi said. “In Cairo,” Dabbashi quickly answered. Hillary Clinton in Benghazi met with Ahmed Gebreel, who worked on Treki's transition into the Presidency of the GA. There is talk of the UN of Ali Treki, former President of the General Assembly, seeking to go into exile rather than come to New York to represent Gadhafi at the UN. But his family is still in Libya. Has there ever been an Ambassador at the UN under duress? Dabbashi earlier at UN: now, only 10 hours? Recognized by UN? A Western spokesperson emerged from the Council to say that the Council is going through the resolution paragraph by paragraph, given the urgency. Russian Ambassador Vitaly Churkin came out and told press he was angry at being portrayed as an obstructionist. The buzz is that Russia by asking questions is seeking to slow things down. “They don't dare veto it,” a source said, “so they seek to slow it down.” But what about the US? Watch this site.